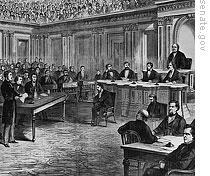 In March of eighteen sixty-eight, Congress tried to remove President Andrew Johnson from office. But the Senate failed in the effort by one vote. Andrew Johnson was a Democrat. Congress was controlled by radical members of the Republican Party. Most of the charges at Johnson's trial were based on his dismissal of the secretary of war. A new law said the president could not remove a cabinet officer without Senate approval. Johnson said the law was unconstitutional. The trial was an important turning point in the making of the nation. Removal from office would have established the idea that the president could serve only with the approval of Congress. The president would have become, in effect, a prime minister, requiring the support of Congress to remain in office. Andrew Johnson's victory kept alive the idea of an independent presidency. Although Congress failed to remove him, the vote did not end a conflict with the White House over the future of the South. 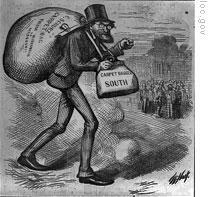 But it did have an effect on efforts to rebuild the South following the war. This week in our series, Doug Johnson and Frank Oliver tell about the reconstruction of the South. The same situation existed in other state governments in the South. In Louisiana, for example, the governor was a carpetbagger from the state of Illinois. He left office after four years with one million dollars. His official pay during that time was only thirty-two thousand dollars. Reconstruction changed the economy of the South, too. White landowners broke up their big farms into smaller pieces of land. They rented these to black farmers. With the land came seed, tools and enough supplies for a year. In exchange for this, the owner would get a large share of the crop raised by the tenant farmer. The reconstruction period changed the face of the South and of the United States. The events of reconstruction also were central to one of the nation's most interesting presidential elections. Our program was written by David Jarmul. The narrators were Doug Johnson and Frank Oliver. Transcripts, MP3s and podcasts of our programs are online, along with historical images, at www.unsv.com. And you can follow us on Twitter at VOA Learning English. Join us again next week for THE MAKING OF A NATION - an American history series in VOA Special English. racial difference is always an severe issue in America,even today the president is black.